Of course Ken Griffey Jr. is going to be a Hall of Famer. He’s going to be a first ballot hall of famer at that, and deservedly so. “The Kid” was among the best in Major League Baseball throughout the 1990s, putting up one of the best decades that the game has ever seen. 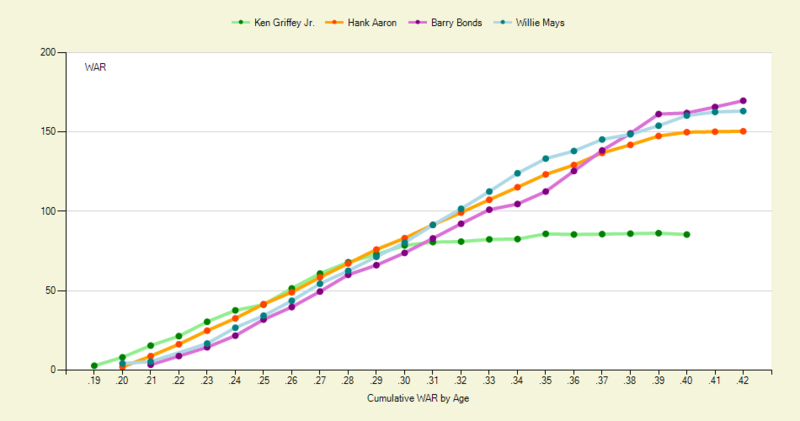 Griffey broke into the bigs at age 19 and never looked back. He posted a ridiculous 7.1 WAR before he could legally drink. By then, he was a legitimate MVP candidate year in and year out. From 1990-2000, Griffey hit 382 home runs (including four league leads), compiled a line of .302/.384/.581 and was 69 runs above average in center field, according to TotalZone. His 1996 and 1997 seasons are both among the great individual performances in major league history. In 1996, Griffey was the original Franklin Gutierrez, posting a ridiculous +32 TotalZone in Center Field. He would supplement that mark at the plate with a .303/.392/.628 line, good for a .427 wOBA. The overall result was one of the few 10 WAR seasons of the decade, coming in at 10.2 WAR. He nearly managed it twice in a row, as in 1997 he nearly duplicated his 1996 hitting line with a 56 HR, .304/.382/.646, .424 wOBA season. The fielding numbers weren’t quite there, but were still fantastic at +15, leading to a 9.4 WAR year. He would end the decade with a staggering 68.7 WAR, already the level of a hall of fame lock. That also includes nearly a full season lost to the strike of 1994 and 1995. In the shortened ’94 season, Griffey had accrued 7.2 WAR in only 111 games, and his .442 wOBA would become his career high. 1995 wasn’t as kind, but Griffey still put up 3.6 WAR in 72 games despite a decade-low .260 BABIP. In 2000, Griffey was traded to the Cincinnati Reds, where his first season would be his only good one. He put up 5.8 wins that year on the heels of a standard Griffey .271/.387/.556 line. He played in 145 games that season, a mark that he would never reach again. From 2002-2004, he would be held below 100 games, and his fielding started to go, as he combined for a terrible -27 UZR in these three seasons. 2005 would be his last productive season, as he hit like Griffey, with a .397 wOBA, but his -19 UZR set him back to only 3.3 WAR. With his legs shot, his BABIP fell dramatically, and as such his hitting soon dropped to the point where his completely absent defense resulted in a replacement level player. He would languish on the rosters of the Cincinnati Reds, Chicago White Sox, and Seattle Mariners for the next few seasons, but the Griffey of old was gone. Through age 31, he was right in line with Hank Aaron, Barry Bonds, and Willie Mays – three of the best outfielders to play the game. Unfortunately, a rash of injuries just simply wouldn’t let Griffey quite reach the level that those three did. Of course, we can wonder for ages about what would have happened. Despite all the misfortunes, Griffey still ended with a fantastic career and a guaranteed spot in the Hall of Fame. Ken Griffey Jr’s prime was one of the best that baseball has ever seen, and one which should be celebrated. His impact on the game of baseball was profound, and I can safely say that he was one of the best players that I have had the pleasure of watching. We hoped you liked reading More On Ken Griffey Jr.’s Career by Jack Moore!